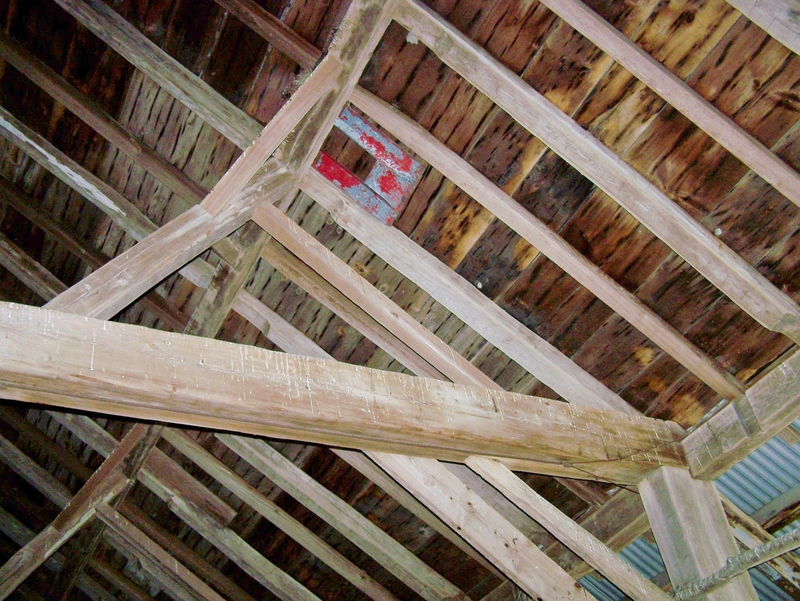 Rare 1760s Gunstock Timber Frame Available – Your New Barn Home? I first wrote about this very early, hardwood timbered barn back in July and am pleased to announce that it is officially available for sale. 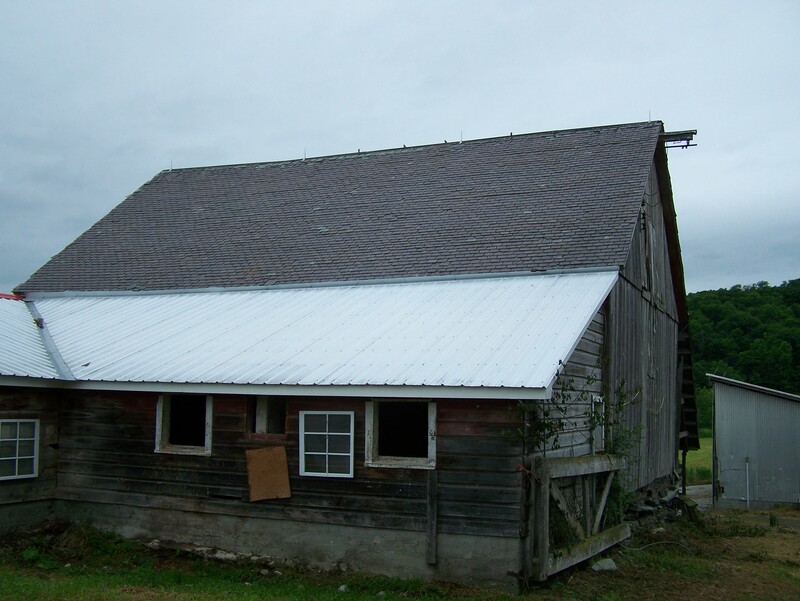 This barn is a real gem and the right owner will appreciate living in such a unique piece of history. 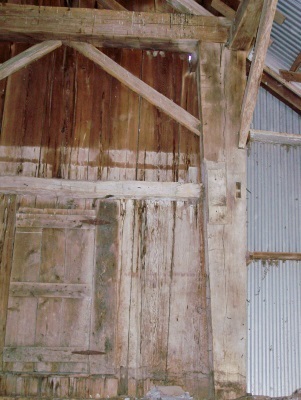 The post and beam barn is truly an extra fine example of “post medieval construction.” This kind of frame design is the same style that was used in building barns in the 1400s. The vertical siding seen above is two layers thick. 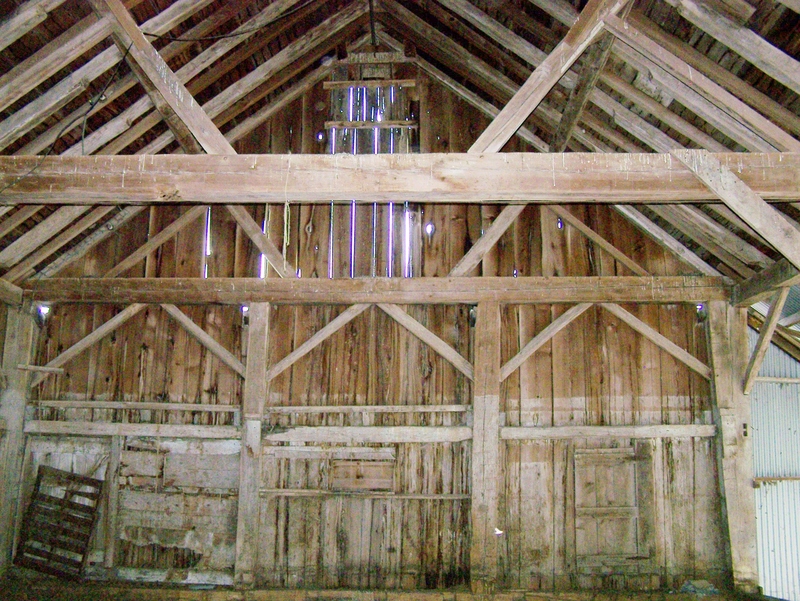 The barn frame was built using several kinds of wood, including beech, chestnut, pine, spruce and white oak. Below, you can see an example of the antique wooden posts inside the frame. Note the gunstock posts which taper top to bottom. The posts are 9″x 9″ square at the base and then taper to 15″ x 9 ” at the top, where they meet intersecting timbers. Here is a view showing how straight the roof line is after 250 years and 7 tons of slate! The potential barn home has elaborate, overbuilt wall and roof systems. The large beams indicate an early built frame. Want to learn more about this beautiful piece of history? Contact us! Consider turning this timber frame into your own barn home! This antique frame would make a beautiful barn home, carriage barn, studio or restored barn. To own this frame is to step back into medieval times! The price for the restored frame includes erecting it on your foundation with roof boards applied. The siding boards are part of the package but would not be applied. The slate roof can be included, upon request. This entry was posted in Frames in stock, Middletown Springs, Timber Frame Projects, Vermont and tagged American Architecture, American Arts and Crafts, American heritage, American History, American Revolution, antique milk barn, available barn frames, barn homes, historical architecture, old barns, Post and Beam, post and beam homes, timber frame, timber framing, vermont architecture by Green Mountain Timber Frames. Bookmark the permalink. Will, thanks for commenting. it is a very sweet frame. Very few left with this design and in such good shape. The owner doesn’t want to maintain it anymore so is looking to sell. I’m impressed with the roof line so straight after 250 years. And with slate on it the last 100 years. That over built mentality has held true to this day. You find that in your covered bridges too.